Thousands of years ago, in ancient Egypt, nineteen year old Tutankhamun is about to die. The details of his death will be known only to a few, who will seek to keep the truth a mystery for evermore. Theirs is an injustice that will prevent the Pharaoh from resting in peace and will prove a victory for the forces of chaos. In the twenty-first century, Charlie Swain is told the location of a secret portal. Through the writing in a mysterious book, he is called to travel through the portal back to ancient Egypt to solve the mystery of the Pharaoh’s death. Succeed, and he will help restore order to the universe. Fail, and the forces of chaos will grow ever stronger. 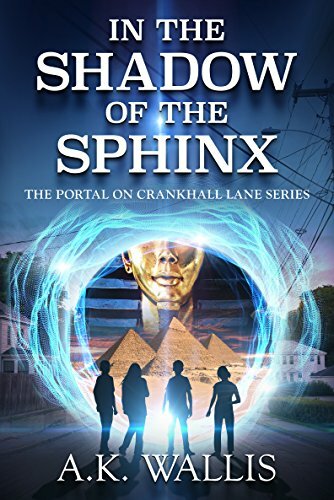 Along with his three friends, George, Paige and Sheena, Charlie must travel back in time to the land that stands in the shadow of The Sphinx, and discover the truth that has gone unspoken for millennia. I used to be an archaeologist and I love the ancient world, especially ancient Egypt, Greece and Rome. Of course, I also love writing and I find the ancient world is full of people and events that inspire a good story and fire the imagination. In the Shadow of The Sphinx was inspired by ancient Egypt and especially the death of Tutankhamun, an event shrouded in mystery. I also used to be a history teacher but found that ancient history is all too often not taught much, if at all. I wanted to write a series of books set in the ancient world so that children can learn about ancient history whilst at the same time enjoying a story that will whisk them back into the ancient past. On a deeper level, this series deals with the classic theme of good versus evil. It also follows the journey of the main character, who must learn to believe in himself if good is to win out. You may also be interested to know that Crankhall Lane is a real street. My grandmother used to live there and it seemed like the perfect name for a street with a mysterious portal! I wanted to create characters people could relate to. My main character, Charlie Swain, suffers from a lack of self belief, a problem made worse by his father leaving, a couple of bullies at school, and the belief that he is not smart because he does not get the best grades. He represents most of us, as we can all find it hard to believe in ourselves and we all come up against people who would have us feel less than we are. Charlie and his three friends, George, Paige and Sheena, each contain something of people I know or have met. George is very smart and is partially inspired by a student I used to teach, Paige is strong and can be fiery, traits that belong to my sister, and my best friend, who I met at school, is called Sheena by her family. Back at school she always had something edible on the go! Eleven year old Charlie Swain turned into the street where he had lived all his life and stopped dead in his tracks. Ahead of him, at the very top of Crankhall Lane, was a small, cobbled alleyway he had never seen before. He was sure it hadn’t been there when he walked to school that morning. The alley was short, so short in fact that Charlie was unsure whether it could be called an alley at all. Before him the narrow, cobbled passageway ended abruptly with a dead end. As is usual for alleyways, it was framed by walls on either side but, less usually, in the right hand wall Charlie could see a single, bay window. Even without going into the alley, it was clear that the window, made up of square panels of glass, was filled with books. He felt a rush of excitement at the realisation and wondered whether it was safe to follow his curiosity and step into the alley that had appeared as if from nowhere. ‘It really is more likely,’ Charlie decided, ‘that I have never noticed it, than it is that someone put an alley and a shop here in no more time than a school day.’ In any case, it was just a bookshop. And no harm ever came from going into a bookshop. Charlie kept his back to the voice and made his decision. Slowly, he took a cautious step into the alleyway, where he was greeted by the sight of a bright, red door in the wall next to the window. Charlie turned to face the door. To his left, a string of warm white fairy lights twinkled in the window filled with the books. In front of him, the red door was cheery and reminded him of Christmas. It didn’t have a traditional handle but instead displayed a large, gold, oval-shaped ring with a cross shape attached to it. Charlie studied the ring on the door. ‘Forget it, Ben,’ said another voice. ‘Even his dad doesn’t think he’s worth the bother. He left him years ago!’ And the voices turned to laughter as Charlie reached out and grabbed the ring on the door. It made a slight creaking noise as he twisted it slowly to the right, and then the door swung suddenly and violently open, pulling him through. With surprise, Charlie stumbled into the shop and was greeted by a tall man with a bald head and an earring that resembled the ring on the door. ‘Friends of yours?’ asked the man, as the comments from the boys echoed down the alleyway. ‘They sound delightful.’ The man gave a half smile to support his sarcasm and Charlie found himself smiling back. The man’s dark eyes were edged in what looked like black eyeliner. His jeans were slightly ripped at the knees, and he wore a t-shirt the same blue as the blazer of Charlie’s school uniform. The clothes and the makeup and the earring seemed a strange combination. ‘Is that an ankh?’ Charlie pointed towards the man’s earring, dangling from his earlobe. The oval loop attached to his ear ended with a cross. They both fell quiet and Charlie felt the man staring at him with interest. ‘So, your father has left?’ asked the man, gesturing towards the open door as a reminder of where he had heard this piece of information. ‘Apparently?’ asked the man, his one eyebrow raised in a pointed arch. The man said nothing but he didn’t take his eyes from Charlie, who felt the weight of his stare. ‘We’re what’s called a pop up shop,’ replied the man. ‘We have appeared quickly and will only be here for a short time. It’s all the rage,’ he continued. ‘Pop up shops are popping up everywhere!’ He laughed at his own joke. As Charlie headed towards the history section he could feel the man’s eyes boring into his back, and the feeling only disappeared when he turned behind a set of shelves and found himself alone. From his place of safety, Charlie dropped his backpack on the floor and took the time to look around. To his right was the window he had seen from the alleyway but it was so full of books he could barely see through it to the alley beyond. The fairy lights continued with their twinkling and brought some additional light to the dark shop. The carpet too, was dark, it’s brown pile doing nothing to brighten up the place. Everywhere there were shelves filled with books. The shelves stretched from floor to ceiling, and ladders were attached to them to help readers reach the books that sat up high. Behind Charlie was a large, dark wooden table, itself covered with piles of books. Nothing in the place seemed new, including the books themselves which, from the look of them, were all old and used. The shop had the musty smell of somewhere that had spent too long locked up from all daylight and fresh air. In the odd shaft of light that made its way through the window and into the shop, dust floated gently. Charlie took a deep breath and allowed his eyes to scan the rows of books before him, all of them filled with knowledge about ancient Egypt, and Greece, and Rome, about the Assyrians and the Babylonians, about some of the most famous people ever to have walked the Earth, and about stories that had lasted through millennia. He didn’t know where to start. Charlie slowly ran his finger along the spines of the books level with his eye line and stopped on a book with nothing on its spine except a small row of hieroglyphs. Intrigued, Charlie began to pull the book out from the shelf but a sudden noise made him stop, and he jumped instead. The noise was a loud thud, and it was followed by a plume of dust that arose upwards from a spot on the carpet next to Charlie’s feet, surrounding him and making him cough. He waved his hand around in the air and when the dust finally cleared, Charlie looked in the direction of the thud. There, at his feet, lay a large, leather bound book. Charlie looked from the book, to the shelf, and back to the book again. Not for the first time this afternoon, Charlie scratched his head in confusion. He had no idea where the book had come from. He looked back to the book he had begun to pull from the shelf and saw that it was still sitting there, packed tightly in amongst the others that shared its resting place; there was no space from where the book at his feet could have fallen. Frowning, he scanned the rest of the shelves around him, looking for a gap that had once belonged to the book that had thudded onto the floor, but there was none. ‘Is everything ok?’ The man shouted from the front of the shop. ‘Erm, it’s fine, thank you!’ Charlie shouted back. Charlie stared again at the book, still lying on the floor. And as he stared the worn cover appeared to change before his eyes. Charlie scrunched his eyes shut tight and then rubbed them but when he looked back, the book’s changing cover was still there. As his eyes focused on the book, it seemed to Charlie that the midnight blue leather began to shimmer, whilst vague, gold images he couldn’t quite make out moved in and out of view on the book’s cover in perfect rhythm. Charlie looked at the window. ‘Is it the light playing tricks?’ he wondered. The more he stared at the book, the more it seemed to come to life and now Charlie could see ancient Egyptian hieroglyphs all over the front cover. Charlie took a step back, feeling afraid. What kind of book was this? Cautiously, he leant in again to take another look, but this time the book seemed like any other in the shop, old and dusty, with no sign of a moving cover. Charlie smiled to himself in relief. It must have been the light after all! He bent down and picked up the book from the floor. Its cover was worn and bits of midnight blue leather had peeled away at the edges, revealing gold patches beneath. Charlie set the book down on the table behind him, doing his best to do it as quietly as possible so as not to draw attention from the shopkeeper. After a quick glance over his shoulder to be sure he was alone, he pulled a chair up to the table and slowly opened the book. Charlie’s mind was spinning with ideas of all that could lie within its pages. He couldn’t wait to find out what was inside, and he realised he was holding his breath as he pulled back the cover. Eagerly, he looked down at the first page, barely able to contain his excitement. Yet, instead of a fascinating world, Charlie discovered only disappointment. Instead of exciting things about the ancients, Charlie was faced with only blank pages. He turned over more of them, eventually opening the book in the middle, and then turning right to the back in the hope of finding a page that wasn’t empty, but all he found were blank stares. ‘How can a book be empty?’ Charlie whispered to himself as he leant back in his chair, deflated. For the second time this afternoon Charlie jumped in surprise, this time as the man’s voice cut through his concentration. ‘I’m sorry,’ laughed the man as Charlie instinctively placed his hand to his heart. ‘Did you find something interesting?’ asked the man again, repeating his question and staring down at the book in front of Charlie on the table. ‘I’m sure! Look!’ Charlie leafed through some of the pages to prove to the man he was telling the truth. Charlie’s eyes widened and he began to feel afraid. The shop was silent. Charlie couldn’t even hear noise from the street. They could have been anywhere. ‘How do you know my name?’ he asked the man, trying to stand from his chair but his legs refusing to obey. ‘Your name?’ The man’s eyes looked straight back into Charlie’s, not so much as blinking. ‘I think I should go,’ said Charlie, managing to stand and beginning to make his way to the front of the shop. The man held out the book but Charlie just stared at it, unsure what to do for the best. ‘Take the book Charlie,’ said the man again, but this time there was an authority in his voice that made Charlie do as he was asked. ‘Thank you,’ said Charlie as he took the book and rushed towards the shop door. Charlie managed a half smile and made his way back out into the alleyway. He headed straight for the street, stopping only when he was back on the familiar pavement of Crankhall Lane and in full view of traffic, houses and passers by. He leant against a wall, clutching the book to his chest and allowing his breathing to return to normal. The strange encounter with the shopkeeper had made his heart beat faster. Eventually, Charlie began to feel calm again and as he leant up from the wall, ready to head home, he realised in a panic that he had left his school bag in the shop. Charlie sighed as he wondered whether going back inside the shop was a good idea, and he turned around to look in the direction of the alleyway. As he did, the shock of what he saw caused him to drop the book from his arms and his mouth to fall open. In front of him was no alleyway, and no shop, but only a brick wall where the alley had been. And against the wall was a single item. As he stared in disbelief, Charlie saw not the alleyway he expected to see but instead a backpack. Against the brick wall, where the alleyway had been, was nothing but Charlie’s blue schoolbag. I am a former archaeologist and history teacher and I love to tell a story. It goes without saying that I also love to read the stories told by others. I have a passion for ancient history, culture and travel, all things which influence my writing. I live in the Midlands in the UK.